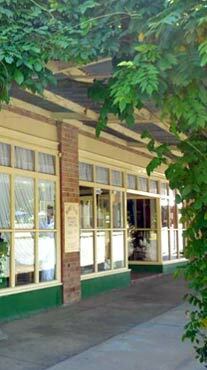 For those who are in the know, Carcoar lays claim to be the most intact historic village in Australia. Long seen by filmmakers as the perfect set for period tales, Carcoar really should be on the bucket list for Australians and overseas visitors alike. The revitalising of the Royal Hotel has encouraged a number of entrepreneurs to take up the opportunity in coming months to open up shops, cafes and guest houses, even a doctor’s surgery. The wonderful shop, Tomolly has opened and is a must visit for interesting and original homewares, and the Village Grocer opened, serving great coffee, cakes, lunches and a stock of foods cooked and uncooked in the the fridge. Next door the Vida Boutique provides the trifecta.They will be open Thursday to Sunday. 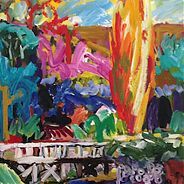 Carcoar is situated in the NSW Central Tablelands, some 260 km West of Sydney and approximately 40 minutes equidistant from Bathurst, from Orange and from Cowra, with an altitude above sea level of 720M that affords a cool temperate climate for year-round enjoyment. Easy access to the village is gained from the clearly signed turn-off on the Mid-Western Highway, the A43: just far enough at under 1km distance to escape the rush of through traffic, yet permitting immediate access to the tranquil oasis and cordial welcome awaiting you in our hospitality and retail outlets. The village has been authentically and fully restored and conserved in close consultation with National Trust heritage advisors. Buildings of note include the Georgian style terrace of shops in Belubula Street, the mid-Victorian era court house in Icely Street, the School of Arts community premises that accommodates an RSL-managed Military Museum on the first floor, the 1849 convict built stone stables on Stoke Lane, St Paul’s Church designed by convict architect Edmund Blacket erected in 1848, the Church of the Immaculate Conception and Shalom House of Prayer both designed by Edward Gell and many more buildings that are redolent of another era. The village is astride the banks of the Belubula River and is situated in a sheltered fertile valley framed by gently rolling hills that give pasture to cattle, sheep, horses and random mobs of kangaroos that gaze eerily statuesque, silently disapproving upon village inhabitants and visitors alike. The Belubula was so named by the Wiradjuri clan of the earlier inhabitants and it means “Stoney River”. It hosts yabbies and introduced trout. In due course it joins the Lachlan River to the East of Gooloogong, having traversed 165km and descended a total of 674M from it source. Carcoar lies at the foot of Mount Macquarie, formerly Mount Lachlan, which at 1,220M is higher than the Blue Mountains and often snow capped and swathed in mists during winter months. 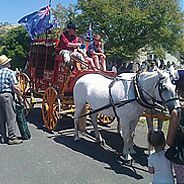 Colonial Carcoar was established in the fertile homelands of the indigenous Aboriginal peoples of the far-flung Wiradjuri clans, custodians of these valleys and streams. Their historical connections to the land and rich cultural traditions are respectfully acknowledged by all who have come to appreciate the nurturing qualities of the district. The loss of the Wiradjuri traditional food gathering areas and culturally significant sites was a major factor in the “Bathurst Wars” of the mid-1820s and historical records are available that testify to the tragic disenfranchisement and murders of ensuing decades. 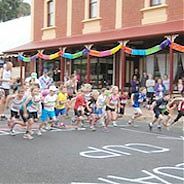 Carcoar is classified by the National Trust as a built environment of significant interest and the Shire Council exercises tight development controls over the historic precinct. It was first settled by Europeans in 1821 and subsequently government gazetted in 1839 at the behest of the wealthiest land owner in the district, Thomas Icely of Coombing Park. 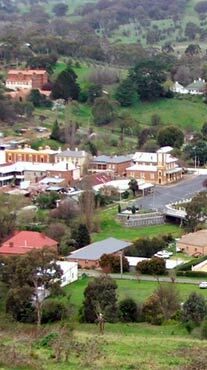 Carcoar is recognised as the third oldest settlement West of the Blue Mountains. Extensive and energetic bushranging activity was rife throughout the area, particularly so after discovery of gold which is still commercially mined in the area. Bushrangers and their sympathisers amongst local squatters and ticket-of-leave men represented a serious threat to exploitation of Icely and his families’ personal ambitions. With gazetting of the town came a troop of mounted police, locally garrisoned. The village quickly prospered, despite tenuous law and order arrangements. 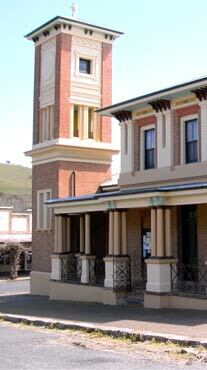 The first daylight bank robbery in the Colony occurred in Carcoar. At the height of its prosperity local settlers numbered some 3,000 souls; a stark contrast to the 218 inhabitants of today! 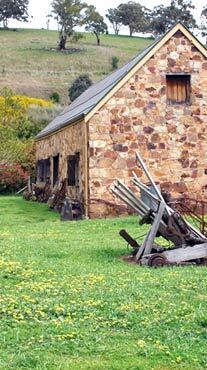 During the C19th Carcoar was considered the most significant European settlement West of the Dividing Range and this is reflected in the substantial government, banking and residential buildings, largely constructed from locally manufactured bricks and quarried stone. Development impetus waned at the end of the stage coach era when the mainline railway bypassed Carcoar in favour of nearby Blayney, whence it headed to Dubbo and the rich Western pastures. Carcoar came late to the rail infrastructure: a branch line was eventually constructed along the ridge of hills above the town as late as 1888, but Carcoar failed to adapt with vigour to the new era and its associated opportunities. This is the tranquil, charming and intact c19th village environment that stands ready to embrace you! Welcome to our Carcoar!